Repairing (reattaching) tendon tears if it is possible to do so without overtightening the tendon. Surgery may be done using arthroscopy, traditional open surgery, or a combination of the two techniques, depending on the type of problem and the method the doctor prefers to use. Surgery can be done with general or regional anaesthetic and can be done as a day surgery or an overnight stay in the hospital. Recovery varies from person to person. Cigarette smoking slows tendon and wound healing. Recovery depends on the amount of time and effort you put into a rehabilitation program. You may not be able to keep doing the activity that caused your tennis elbow. Or you may have to make some changes to the way you do that activity in the future. You still have elbow soreness and pain after more than 6 to 12 months of non-surgical treatment. Corticosteroid shots have given good short-term pain relief but the pain has returned. You cannot perform daily tasks and activities because of elbow pain. Various surgical procedures are used to treat tennis elbow. Most people are able to return to their previous activities after tennis elbow surgery. Be sure to change any previous technique, equipment, or activity that has been linked to the elbow pain. Surgery for tennis elbow is seldom needed because the condition usually improves with tendon rest and nonsurgical treatment like shockwave therapy or platelet rich plasma therapy. Call (+65) 6471 2674 (24 Hour) if you wish to see our doctor and discuss the surgery for tennis elbow further. These conditions cause pain at the points at which the tendon attaches to the bone around the elbow. Tennis elbow causes pain on the outer side of the elbow, where the extensor muscles on the outer side of the forearm are attached. These muscles bend the wrist back and straighten the fingers. Golfer’s elbow is much less common and causes pain on the inner side of the elbow, at the attachment of the flexor muscles which bend the wrist forwards and flex the fingers. Both conditions were first described in sportsmen but most sufferers develop them as a result of everyday activities, such as repeated heavy lifting, pushing and pulling. Sometimes a single episode of awkward lifting, such as lifting a heavy case down from an overhead locker, may be the trigger. The lifting need not be heavy: office workers who repeatedly pull files out of tight, over-stuffed cabinets are also at risk. Anti-inflammatory injection into the painful area is usually helpful. Physiotherapy may also be beneficial. If the above treatments fail to improve the symptoms, one can try Shockwave Therapy or Platelet Rich Plasma Therapy. But most important is to work out what caused the problem in the first place and avoid the activity in the future, otherwise the symptoms may recur and can become chronic. Call (+65) 6471 2674 (24 Hour) to Treat Your Elbow Pain Today. 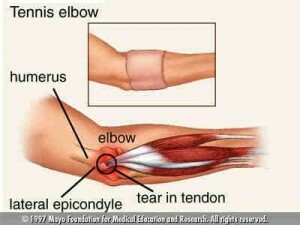 What is Tennis Elbow or Medial Epicondylitis? How is Tennis Elbow or Medial Epicondylitis Diagnosed? Treatments include heat therapy, local injection of cortisone and numbing medication, physical therapy and shockwave therapy to break up scar tissue which promotes healing and increases blood flow to the afflicted area.